The powerful leader of Romania’s governing party — convicted of voter fraud, suspected of stealing millions of dollars of European Union funds, and soon to face a verdict in a case involving abuse of power — had a message for the more than 100,000 citizens who gathered in one of the capital’s main squares recently: He is the victim. The Superior Magistracy Council’s prosecutor section rejected on Wednesday, June 13, one of the Judicial Inspection’s disciplinary actions against the chief prosecutor of the National Anticorruption Directorate (DNA), Laura Codruta Kovesi. The Judicial Inspection argued that Kovesi violated her duties when she sent one of her councilors to perform a control at two DNA offices in the country. The CSM’s decision can be attacked at the High Court of Cassation and Justice, local News.roreported. However, the Judicial Inspection has two other disciplinary actions against the DNA head, both started in the past year. 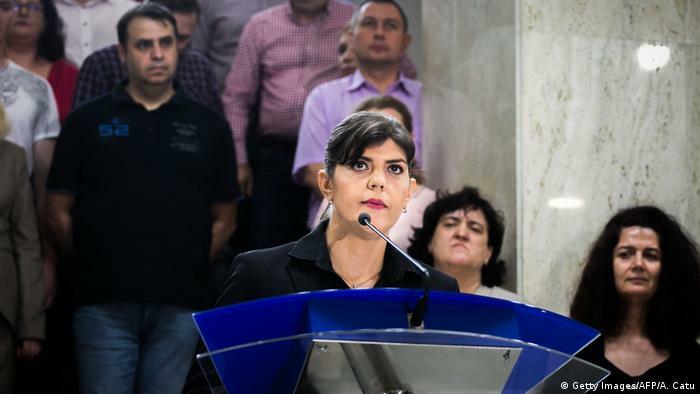 Kovesi has been accused of violating her duties and of behavior incompatible with her position, which may have damaged the image and reputation of the local justice system. Justice minister Tudorel Toader asked for Kovesi’s dismissal from DNA’s helm in February but president Iohannis refused to sign the order. Romania’s Constitutional Court decided at the end of May that the president must accept the minister’s request to dismiss Kovesi, but the president said he would first analyze the court’s motivation. Romania’s ruling Social Democrats and thousands of supporters rallied outside government headquarters in Bucharest on Saturday in protest at alleged abuses of power by anti-corruption prosecutors. The rally was seen as the ruling coalition’s response to a series of large anti-government street protests held against Social Democrat attempts to decriminalize several corruption offences via emergency decree last year. The popular outcry forced the Social Democrats to withdraw the decree. Romania is one of the European Union’s most corrupt states and Brussels keeps its justice system under special monitoring. The argument over how hard to fight corruption in Romania has dominated its politics since it joined the EU in 2007. Anti-corruption prosecutors have secured a spate of convictions against lawmakers, ministers and mayors in recent years, exposing conflicts of interest, abuse of power, fraud and the awarding of state contracts in exchange for bribes. But leading politicians, some of whom are currently under investigation or on trial, have denied wrongdoing and accused prosecutors of using their powers for political persecution. Romania’s anti-corruption agency (DNA) has released its first statement in reaction to the Constitutional Court’s decision on Wednesday which said that president Klaus Iohannis must move forward with the dismissal of DNA’s chief prosecutor, Laura Codruta Kovesi, following the proposal of Justice minister Tudorel Toader. Le président roumain Klaus Iohannis doit lever son veto à une révocation de la cheffe du Parquet anticorruption (DNA), exigée par le gouvernement en dépit des protestations de l’opposition et de la communauté internationale, a décidé mercredi la Cour constitutionnelle. Le chef de l’Etat (de centre droit), “n’a pas de pouvoir discrétionnaire” dans ce domaine et doit par conséquent “émettre le décret de révocation” conformément à la demande du ministère de la Justice, a tranché la Cour dans une décision sans appel qui représente une victoire majeure pour le gouvernement social-démocrate. Plusieurs responsables de la coalition de gauche au pouvoir se sont aussitôt félicités de cette annonce, estimant, à l’instar du président du Sénat Calin Popescu-Tariceanu, que la procureure, Laura Codruta Kovesi, “aurait dû démissionner depuis longtemps”. Pour l’opposition de centre droit toutefois, cette décision, prise par six voix contre trois, “porte gravement atteinte à la crédibilité” de la Cour. Un millier de personnes sont descendues dans la rue à Bucarest pour exprimer leur soutien à Mme Kovesi et “défendre la démocratie”. More than 900 Romanian magistrates signed by Monday evening, May 21, a “resolution for defending the rule of law,” a document made public by the Forum of Judges in Romania and initiated on Saturday during a protest staged in front of the Palace of Justice, attended by more than a hundred judges and prosecutors, local News.ro reported. The magistrates said they adopted this resolution amid the recent public developments on amending the laws of justice, which seriously jeopardize the independence of the judiciary and the course of the Romanian state within the European Union and the Council of Europe. They also said that the overwhelming majority of Romanian judges and prosecutors didn’t accept the draft laws on the activity of the judiciary, the magistrates’ opinion being ignored. The Romanian magistrates also noted the statements of the justice minister and of the representatives of the legislative power, which they say minimize the report of the Group of States against Corruption (GRECO), the Council of Europe’s anti-corruption body. They also said that the legislative proposals that are currently under public debate represent an involution in the creation of a modern criminal justice system adapted to the new social realities, as well as a distortion of the purpose of the criminal process and the state’s criminal policy. They also remind of the unprecedented attacks on numerous judges and prosecutors who are also involved in cases of high corruption, as well as the most important state institutions, with a defense and public security role, including the National Anticorruption Directorate (DNA). Also, the magistrates said the minister of justice is allowed to publicly attack all the DNA prosecutors, speculating that they manage evidence in violation of the law.